Eight years earlier, the people of this small Central American republic had succeeded in toppling the Somoza dictatorship, ushering into power a leftist government with a reformist agenda for literacy, health care, education, unionisation, women’s rights and land distribution. However, it wasn’t long before the new Nicaragua found itself at the pointy end of an economic and military destabilisation campaign, waged by counter-revolutionaries and covertly funded by the United States of America. My motivation for joining the work brigade was a mixture of curiosity and passion. I was intrigued by the Nicaraguan social experiment, eager to see it at first-hand, and keen to do whatever I could to actively bolster its chances of success. And, to be honest, I was following my heart, which at that time was firmly in the grip of the tall, blond, seductively articulate idealist who had introduced me to protest marches and the poignant lyrics of Chilean songwriters. But our grand adventure left me with some misgivings. Before going to Nicaragua, I’d assumed the labour shortage was directly attributable to the war, and that the function of the international brigades was to help fill the breach. I ended up realising both these assumptions were hopelessly simplistic. 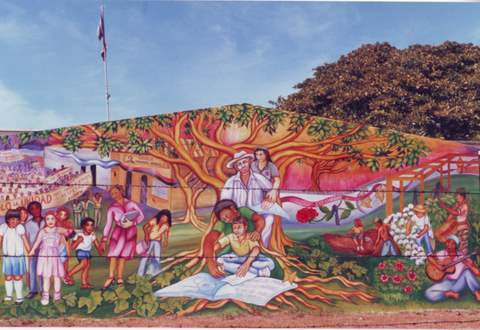 The Nicaraguan economy had chronic structural problems that were not caused by the war, although of course the war made them worse. The number of people in the service sector was grossly disproportionate to the number in the productive sector. And it was easy to see why. Somebody hawking snow cones at a Sunday baseball match in Managua could make more money in a day than a farm worker could earn in three weeks. Facing rampant inflation, the government had limited capacity to deal with this issue by raising the minimum agricultural wage. The international brigades did serve to put more hands in the fields at harvest time, even if those hands were only picking at roughly half the rate of a skilled worker. We brigadistas went to Nicaragua with good intentions and much enthusiasm, but our presence there had some paradoxical repercussions. After a long hot day of labouring, queuing to hand-wash our clothes was the last thing we felt like doing. So we employed a local woman to do all our washing. She would otherwise have been picking coffee, but she could earn so much more by selling her services to us that she was quite happy to change careers twice a week. So was our full-time cook, Luisa. So too were the people who trotted up the mountain to sell us sweetbread and watermelon. The complex, intractable situations that can unexpectedly confront well-meaning volunteers in developing countries, and the distortions that aid itself can induce, are themes explored by Robin Jones in the book she is writing about her year in Africa. Under the auspices of the Jesuit Refugee Service (JRS), Robin went to Lobone in South Sudan, a camp of 32,000 people who had fled their homes during the course of a long-running, vicious civil war. She arrived in 2006, a year after the peace agreement was signed, to help build the education system by teaching teachers. With 45 years as an educator behind her, and experience living and working in Ghana and Papua New Guinea, Robin was no starry-eyed girl fresh from university. Also, as one of the founding members of the Armidale Sanctuary group, she had close connections with the Sudanese families sponsored to come and live here. Robin lived like the locals, on a diet of maize and beans, in a hut made of grass, clay and bamboo, with no running water and only unreliable diesel-generated electricity. Whenever she left the camp, she was accompanied by seven armed soldiers. She expected all of this. What she hadn’t expected was that her attempts to introduce the South Sudanese to best practice teaching methods would meet with such limited success. “I went expecting that I could train teachers. In five main areas: early childhood, primary, secondary, peace education and adult literacy. But I hadn’t realised how resistant to change people who’d gone through 20 years of enormous insecurity would be. While I think I did have an impact on a few, the majority were not in a position to accept new ideas. None of them were trained, so of course they relied on their memories of what their own education had been like. Chalk and talk and using the cane. And they were just emerging from a war. Almost all the teachers were men, almost all of them would have been using guns for the last 15 or 20 years, since they started as child soldiers. Struggling to survive and kill the enemy, stealing food to live. It doesn’t put you in a good healthy mental state to take on the ideas of teaching that someone from overseas is bringing,” Robin said. The 200 teachers under Robin’s tutelage were only semiliterate themselves and although JRS provided exercise books and pens, neither the teachers nor their students had access to a single textbook. Teachers received a dollar a day. Teaching, nursing and trading were the only occupations in the camp, so positions were highly sought after. Despite this, at any one time only about one-third of the teachers would actually be standing in front of their classes. Her biggest concern, however, was a growing awareness of the harm wrought by ill- conceived, irresponsible aid. The afterword of Robin’s book presents a list of practices non-government organisations should observe in providing assistance to individuals and communities. For she is not arguing that there should be no aid. She thinks that aid is essential, especially for health, education and infrastructure and particularly for South Sudan, one of the least developed countries in the world. But it has to be handled in a way that empowers the recipients, works with them rather than for them, and includes a clearly defined exit plan. Like me, Robin believes her time as a volunteer abroad was valuable and worthwhile, despite the complicated gap between our original intentions and how things panned out. To her surprise, she found her greatest impact was in the human rights area. She spoke to girls about the inadvisability of getting married and having babies at the age of 14, before their bodies were fully formed. She urged them to complete secondary school and argued against the prevailing notion that females have more limited intelligence. She showed the girls how to fashion sanitary pads using material, pins and grass, so that they wouldn’t stay home from school for several days each month. During her time in Lobone, a record eight young women completed Secondary 4, roughly equivalent to our Year 10, and the minimum qualification for becoming a teacher. And me? I eventually realised that the main function of the international brigades was to forge safety links between Nicaragua and the rest of the world. The harvest was never really our coffee beans; it was a crop of well-informed people. I was in Nicaragua at approximately the same time, and in the same area. Could we contact? It was a long time ago! Who did you go there with, and how does your experience compare? I was with the sandiego teachers committee in central america. We built a school, houses and laid piping for clean water. Some of our group were appaled with the extreme poverty and seldom came to help. I was a leader so I had to organize whom ever showed (internationalistas) up to work and took people to clinic, stayed w them, lots of stuff. Am writing up journal now. I think you may underestimate your impact in nica. Your presence alone brought peace and stability to the area for many reasons. I certainly don’t regret going, and I’m sure on balance our presence there was a good thing. But it was all much more complicated than I had foreseen. This article, “Volunteers Abroad” cannibalised an unpublished piece that I first wrote in Managua in February 1987. I’d hoped it might appear in The New Internationalist. When they rejected it, I put it away in a drawer and there it stayed for a very long time, until I eventually became a journalist and was able to pull some bits from it for this story. “Another thing that made me feel uncomfortable about my role here was the experience of riding around Managua in the bus provided by the CNSP, the Nicaraguan organisation that coordinates the agricultural, technical and construction brigades. In Australia, 32 people on a bus would be regarded as a reasonable load. In Managua, with its incredibly overcrowded public transport system, and its long queues of people waiting and waiting for buses that arrive full at every stop, 32 people represents an empty bus. The queued faces that stared up at us as we trundled past in “our” bus were not alight with welcoming smiles of solidarity. They looked understandably resentful of our privilege. The Nicaraguan people are feeling the strain of shortages and rationing as the war drags on and on with resources so tight. Are the international brigades more of a burden here than a help? We came and picked a little coffee, took quite a few photographs, and learnt about Nicaragua. In this last point lies the key to understanding how the brigades do actually benefit this country. The justification for our time here came more from what we learnt than from what we picked. Everyone we spoke to exhorted us to go home and tell what we had seen here. To tell about the realities, the hopes, the problems. Nicaragua cannot afford to become isolated from the rest of the world, because if it does the United States will crush it. The international brigades forge safety links, and the most important work that the brigadistas do is back in their own countries, when they talk about their experiences and impressions of Nicaragua. Our CNSP bus drove us around during the study week that followed our three weeks at a state coffee farm in the Matagalpa region. We had meetings with a variety of social and political groups, discussing subjects like the new constitution, liberation theology, the position of women, the unions, the press, the literacy campaign, the autonomy of the Atlantic Coast. It was a hectic week. I came away impressed by the achievements and aspirations of the Sandinista government. Our group had very little formal organization. We, and several other groups came down without any formality, just some “enculturation,” and we had some good workers in the group, but the coffee coop we worked on was filled with people from Managua who were “replaced” in the rural area and refused to come out. I will admit it was rugged, and often beneath many health standards. Half of the children died while we were there, a common statistic. Couldn’t get a priest to come out. It was hard, and much less than hand-to-mouth for us. You are a gift to hear from, Going to call a reunion to go down and visit again? Wonder how many of us would show? We were organised by a Sydney group called RACLA (Resources & Action Committee for Latin America). It operated from near where I used to live in an inner-city student suburb called Newtown. There was also a Latin American Cultural Centre there called La Pena where we’d go to hear music, speeches, and learn Spanish. Will send you some more via email.